The 18th International Conference on Harmful Algae (ICHA) in Nantes, France, attracted a record high number of over 750 participants. Amongst them were several CoCliME partners, promoting the project with poster presentations that described regional case studies and through oral presentations focused on time series analysis or results from laboratory experiments. Two outstanding studies were presented as ignite talks by our CoCliME-rs Sylvain Gaillard and Kévin Drouet. 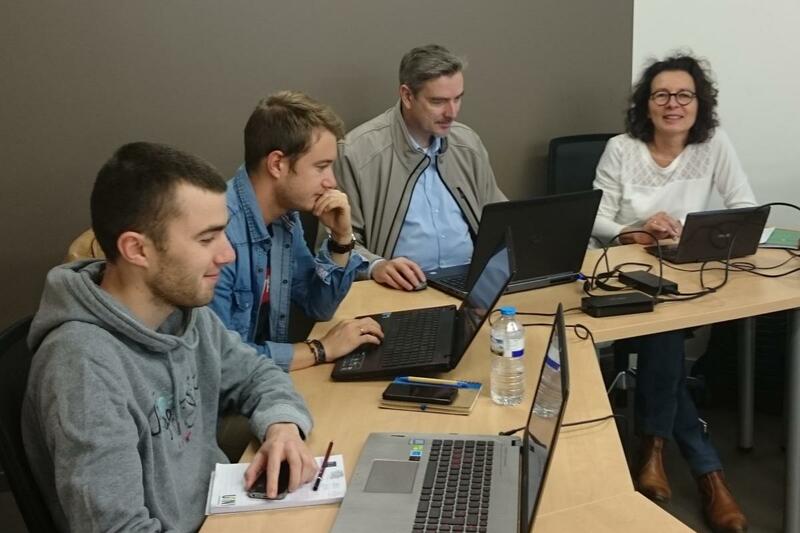 Sylvain Gaillard, Kévin Drouet, Philipp Hess and Véronique Séchet (left to right) at the CoCliME General Assembly meeting in Paris. Ignite talks are a new format introduced by ICHA, were researchers have to condense months, if not years of research into a brisk, no-nonsense, 5 minute presentation. It not only gives a large number of researchers the opportunity to present their work, but, also forces them to think about the one key message to summarise an otherwise overwhelming amount of work. Sylvain, as part of his ongoing PhD project at Ifremer, studies the effect of temperature on the harmful phytoplankton Dinophysis. Despite most algae being very ‘plant like’, some single celled chlorophyll carrying organisms, like Dinophysis, choose a more ‘predator’ like behaviour and hunt smaller prey. What makes life hard for Sylvain is that the main prey of Dinophysis is a predator itself, hunting yet smaller, defenceless prey! 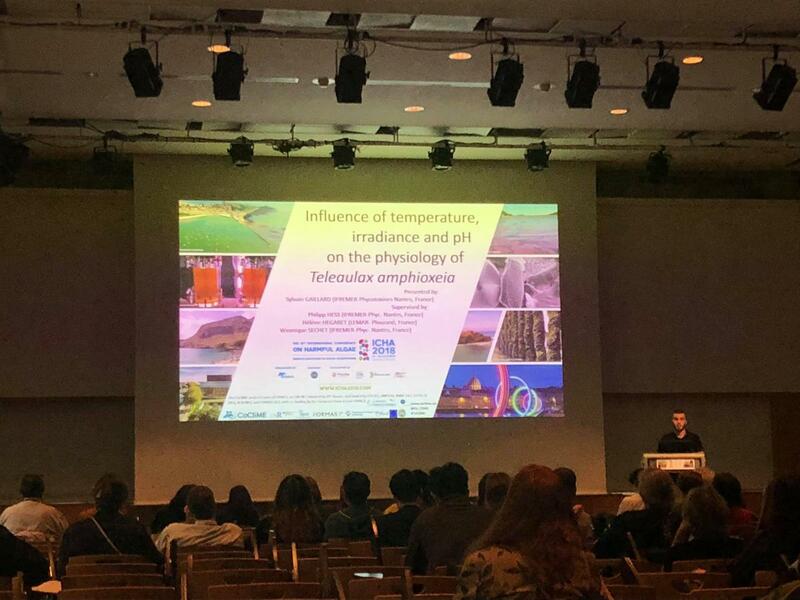 Importantly, Sylvain and his colleagues chose to look at the effect on temperature not on Dinophysis directly, but, on the lowest trophic level, i.e. the prey of its prey. 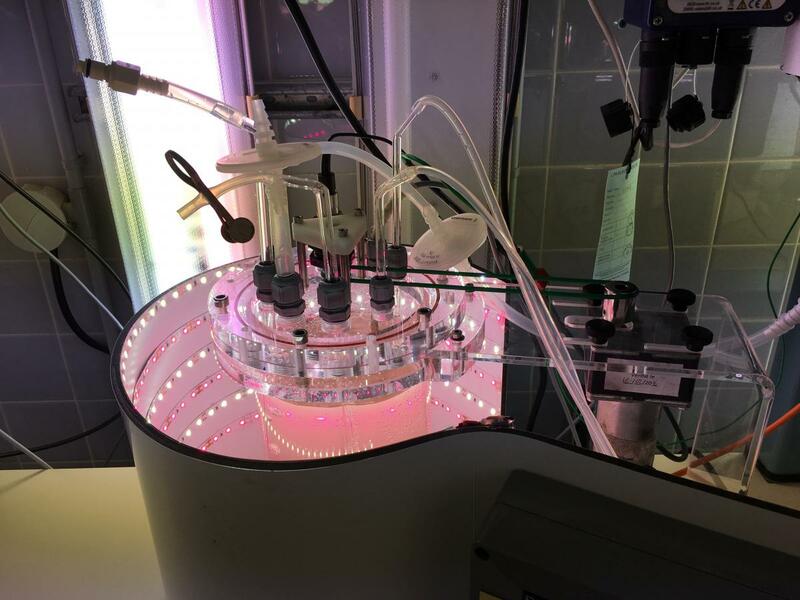 Higher water temperature resulted in an increase in growth, suggesting that warmer waters will have an indirect positive effect on the growth of Dinophysis by increasing its food availability. Laboratory set up to study the effect of changing environmental conditions on Dinophysis food webs. Kévin, who is a second year PhD student at the Laboratoire d’Océanographie de Villefranche, presented work on an Ostreopsis time series, another type of harmful phytoplankton. Kévin was also looking for signals linked to a changing climate. Interestingly, and in contrast to Sylvain’s work, Ostreopsis bloom duration and the rate of Ostreopsis increase between samples was unaffected by higher summer temperatures. It seems, the effect of climate change on harmful Ostreopsis blooms, unveiled by Kévin and his colleagues, is more intricate. Their study also looked at the effect of spring sea surface temperatures on Ostreopsis bloom dynamics, which showed a positive correlation between a warmer spring and an early start of the bloom. This means, as Kévin explained during his ignite talk, that future blooms of Ostreopsis could appear earlier each year due to our changing climate. Both studies investigated the effect of temperature, directly and indirectly, on the growth and occurrence of harmful algae blooms and, provide an important foundation for the development of climate services. For more information, check out the guys posters summarising their work in the publication section of our website.